The BVH (The Humanistic Virtual Libraries) exist since 2003 : they publish Renaissance fac-similes, online editions (using TEI encoding standards), and develop tools in order to enhance research on OCR, typographic material, literary and linguistic issues. 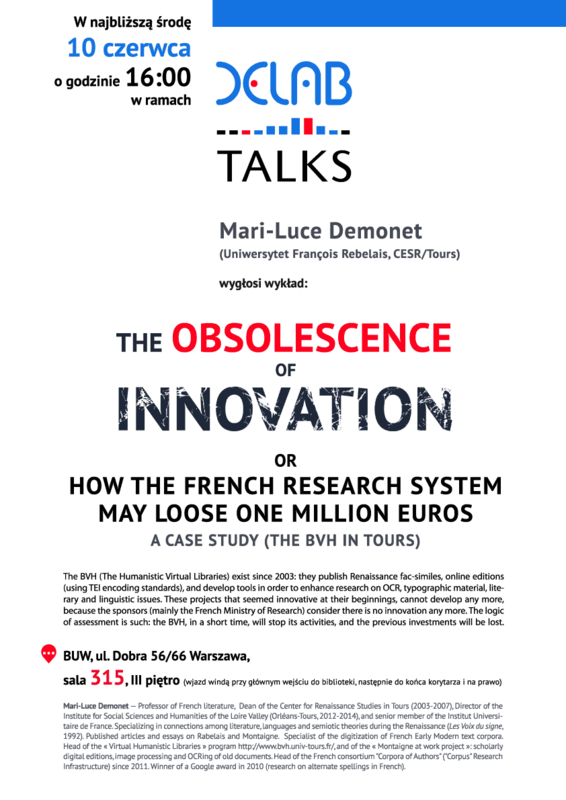 These projects that seemed innovative at their beginnings, cannot develop any more, because the sponsors (mainly the French Ministry of Research) consider there is no innovation any more. The logic of assessment is such : the BVH, in a short time, will stop its activities, and the previous investments will be lost. Prof. Mari-Luce Demonet Professor of French literature, Dean of the Center for Renaissance Studies in Tours (2003-2007), Director of the Institute for Social Sciences and Humanities of the Loire Valley (Orléans-Tours, 2012-2014), and senior member of the Institut Universitaire de France . Specializing in connections among literature, languages and semiotic theories during the Renaissance (Les Voix du signe, 1992). Published articles and essays on Rabelais and Montaigne. Specialist of the digitization of French Early Modern text corpora. Head of the « Virtual Humanistic Libraries » program http://www.bvh.univ-tours.fr/, and of the « Montaigne at work project »: scholarly digital editions, image processing and OCRing of old documents. Head of the French consortium “Corpora of Authors” (“Corpus” Research Infrastructure) since 2011. Winner of a Google award in 2010 (research on alternate spellings in French).